The bottom station of the Iskogel lift will of course still remain. We are confident that in the future in Gerlos there will be less traffic and fewer waiting times. Experience the newly built high rope course with 55 stations with a flying fox of course! After enrollment, you can start the adventure while showing your courage and your skill. 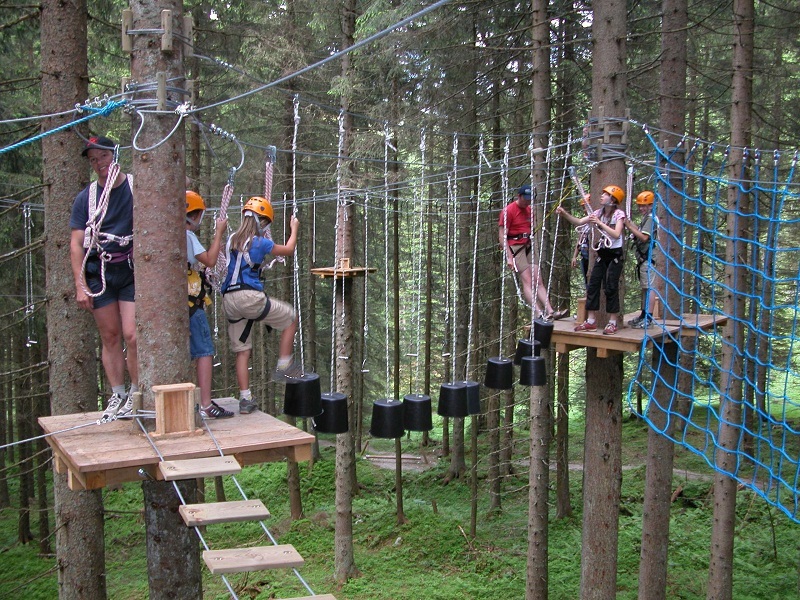 The high ropes course is a series of elements, which are mounted on a group of tree trunks about 10 to 15 meters high. This rope course is like an obstacle garden consisting of ropes, wire ropes and tree trunks, which is completed in the form of a course..
Special safety for children with the Smart Belay! If a carabiner is open, the other carabiner detects it and with proper application of the product, blocks the opening mechanism until the first carabiner is hooked and locked onto the safety rope again. Inadvertent complete unhinging is virtually impossible under proper use! Equipment: Sport clothing, trainers or walking shoes. Dates: In July und August (28.06. – 01.09.2016) opened daily from 10.00 till 17.00 – no reservation is necessary. In May, June, September und October only possible with reservation.